Get your copy from Mill Creek Entertainment. This mini series is one of my favorite versions of Frankenstein. I love the way Frankenstein is presented. He's still a monster, but one that you can't help but empathize with. You feel for him. You want the woman to love him, even though you know he's done terrible things because none of it is really his fault. Because it's a mini series, you also get the whole story, uncut and fully in depth. It's probably the closest rendition to the book you can find. From watching the doctor began his tale on the boat to the possibility of the monster still being out there somewhere, this film will leave you on the edge of your seat. This version of Frankenstein is beautiful in it's horror and heart-wrenching at the same time. Any fans of the horror genre should have it in their collection. 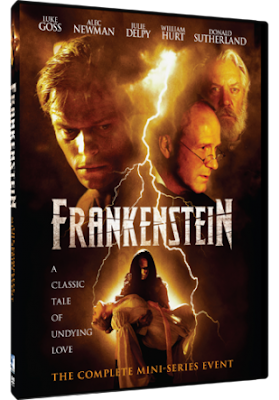 One lucky winner is going to receive a DVD copy of FRANKENSTEIN THE COMPLETE MINI-SERIES EVENT. To enter, just fill in the Giveaway Tools form below. This giveaway will 3/1/16 and is open to the US only. The winner will be notified via email and will have 48 hours to reply. Thanks again to Mill Creek Entertainment for offering this fantastic prize. I would like the William Castle Horror Collection. i want to get the rainy day romance collection, it looks nice. Ugly Benny looks like a good family movie. I'd love to own The Partridge Family - The Complete Series. I loved that show when I was growing up. I would love to get the Dennis the Menace DVD for my grandson. I would love to have the DARK SECRETS FOUR MOVIE COLLECTION. I love all the featured movies. I would love to own Bewitched - The Complete Series! I would like The Jeff Foxworthy Show. I would like the I Dream of Jeanie Complete Series. I watched it growing up and I think my grandkids would really get a kick out of it! I would love to have any of the Madeline dvds. I'd also love the Bewitched series! I loved that show as a kid, and I know my own children would love to watch it, too! The Minister's would be great. They were one of my favorites growing up. I'd love to have the Horror Freak Fest Bundle Pack to add to my constantly growing collection of horror movies.